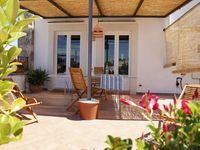 Property 14: B & b Nonna Jole Beach "Costa Salento"
Charming House in the Heart of the Historical Center of Lecce, surrounded by Beauty. 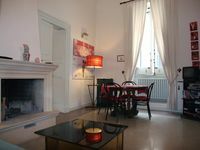 Property 25: Charming House in the Heart of the Historical Center of Lecce, surrounded by Beauty. Property 29: Roca Vecchia: Villa on the sea, with garden and veranda! An old town house in the Centro Storico, situated between two seas. Property 44: An old town house in the Centro Storico, situated between two seas. A girlfriend and I spent six nights at this apartment in Lecce. We had a slightly uneven start to things when no one was there to meet us despite my making sure our arrival time was passed along to our host. We had to make several attempts over 30 minutes to contact him, but he was quite apologetic and very nice when he arrived. The apartment is very quiet although at night if people walk down the street, the sound echoes. Since I wear earplugs, this was no bother and I would recommend earplugs generally for people who're staying in an inner city residential area. Both bedrooms were spacious, there was a comfortable living room, and there are two bathrooms. Neither bathroom is en suite, though, and one of them is accessed by going up to a second floor. The other is accessed off the kitchen. Very small showers in both. The kitchen is faily well appointed but there is no microwave and no coffee pot. There are two Mokas but if you don't know how to use them, you might go coffeeless. Stefano did bring us a small cafetiere to use for which we were grateful. There is also a lovely roof terrace. You do have to be able to manage stairs, though. There is a stairway up to the apartment and two stairways to get to the terrace. As long as you can manage stairs, you'd be fine. Stefano made lots of suggestions which were extremely helpful. Altogether, Lecce was a real treat. Spotlessly clean, friendly welcome, great location. A return trip to Lecce would definitely involve staying here!! !